This autobiographical film from Louis Malle is set in occupied France in 1944. 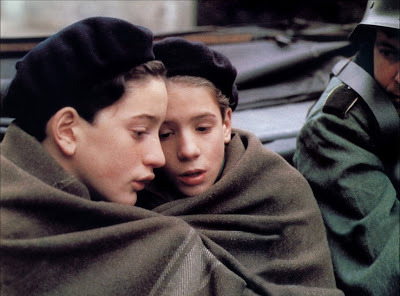 The premise is quite simple: A boarding school run by Carmelite Brothers hosts not only the children of France's wealthy and privileged elite, the brothers also take in some Jewish boys, change their identity and hide them within the school community. Malle's character is the bright Julien Quentin (Gaspard Manesse) who is drawn to new boy Jean Bonnet/Jean Kippelstein (Raphael Fejtö) who seems to be different. Their friendship goes through the usual evolution for boys of that age: indifference/admiration/conflict/friendship. On one level this is a gentle tale. The community of brothers and the Catholic hierarchy are portrayed with sympathy and even the German military are depicted as being more kindly than is usually the case in cinema. Only the Gestapo officer is shown to be ruthless, but even here it is tempered ruthlessness. The community of the boys in the school and those who look after them is shown as being an harmonious one which is capable of displaying acts of deep humanity from time-to-time. The Brothers ensure that the boys are kept up to date with developments of Allied progress on the Italian and Eastern fronts. A thriving black market is run by the kitchen helper which ensures that the usual extra-curricular activities are supported. The school pigs are fattened for slaughter to be ready for the annual visit of the sponsoring parents. The headmaster, Père Jean preaches a sermon that reminds those who have much, that much will be required of them - this is uncomfortable for some to hear. The film manages to sustain a tension as it explores the trauma of living with military occupation. It gently shows the emotions of both war time and school days, it is a film about friendship, risk-taking, betrayal, sacrifice and loss. It is an engaging and delightful film - although I felt that it could have engaged with themes a little more directly and depicted them more brutally (realistically). Made in 1987 this film was nominated for two oscars and won a Bafta the following year. It is a film that opens a window onto a carefully selected and I feel santised, depiction of the world of war-time France. It raises plenty of moral questions and invites viewers to ask themselves "what would I do in that situation?". I like films that do that. If you've not seen this, please do. I'll give it 7/10.